This orchid is one of Jersey’s special flowers and makes a wonderful sight in the orchid field in St Ouen in late May and June. The purple flowers are well spread on the stem, hence the Latin name and the alternative name of Loose Flowered Orchid. 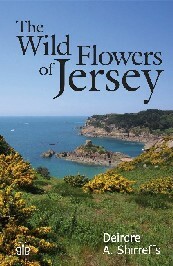 It is not exclusive to Jersey being found in Europe and also in Guernsey. In fact, it is more common in Guernsey, but Jersey botanists named it first ‒ apparently the Guernsey botanists were a bit annoyed. Both the Jersey and the Common Thrift grow in Jersey, turning the roadside at St Ouen’s Bay pink. The Common Thrift flowers in May and the Jersey Thrift flowers later, in late July and August. The Jersey Thrift is also distinguished by its taller flowering stems. It is originally from central and southern Europe and is not found in the other Channel Islands or Britain. Thrift plants are adapted to the dry seaside conditions by having a cushion of narrow leaves and very long roots which reach down to find water. Because of these adaptations, Thrift can also grow on mountains. This heather has smaller paler flowers than the previous species. It is common on cliffs and coastal heaths. Plants with white flowers are sometimes found, the ‘lucky’ white heather. In the past it was used for fuel, and the name comes from the Anglo-Saxon ‘lig’ meaning fire. The twiggy stems were also used for bedding and thatching, and made into brooms. Calluna comes from the Greek for brush. Bees love heather and make the nectar into a dark, strong-flavoured honey.